Red Poppy group on Flickr, mostly real flowers rather than designs or art/ crafts. Flowers by Irene has a pretty knit/ crochet poppy. Frayed at the Edges makes a knit poppy. Erssie Knits has a crochet poppy but the pattern is not available on the site. Seawood has crochet poppies (flowers) with a big button in the middle. Ch 6. SS into 1st stitch to form a ring. DC into each DC, increasing every other stitch to get 36 stitches. 1 ch [1 dc 1 tr 7dbltr 1 tr 1dc 1ss] 3 times with last ss into 1st ch. For the centre I really just made it up as I went along. It’s a bit hard to describe but I basically made lots of loops and tied them together (a bit like making a tassle) then cut off the tops and stitched into the centre of the poppy. Curious and Crafty Readers has the loveliest crochet poppy pattern of them all, I think. Here is the centre and the other page has extra finishing touches. Who do we have to remember? My Grandfather was a sailor during the war but he died so long ago I barely remember him. This time around I’m not feeling sentimental about Rememberence Day. I didn’t even buy a stack of felt poppies as I usually do. 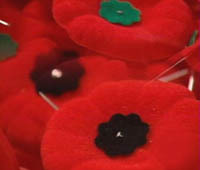 I used to pin them all to my car’s visor and have a field of soft poppies each year.